If you don’t know much about kombucha, it’s basically a fermented tea made by utilizing a squishy, pancake-like yeast culture (usually called a scoby). 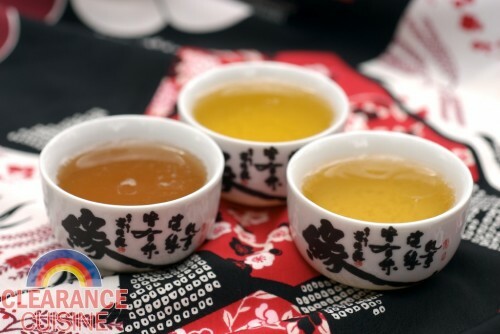 Like most other fermented products (beer, wine, vinegar, yogurt), kombucha has attracted quite the cult following, generally of hippies, yuppies and the aforementioned celebrities. Keeping this in mind, I do constantly fear for the day that kimchi and kefir are featured in People magazine (thankfully, the Oprah show isn’t a threat anymore) and I’ll have to insist that I liked them before they went mainstream. 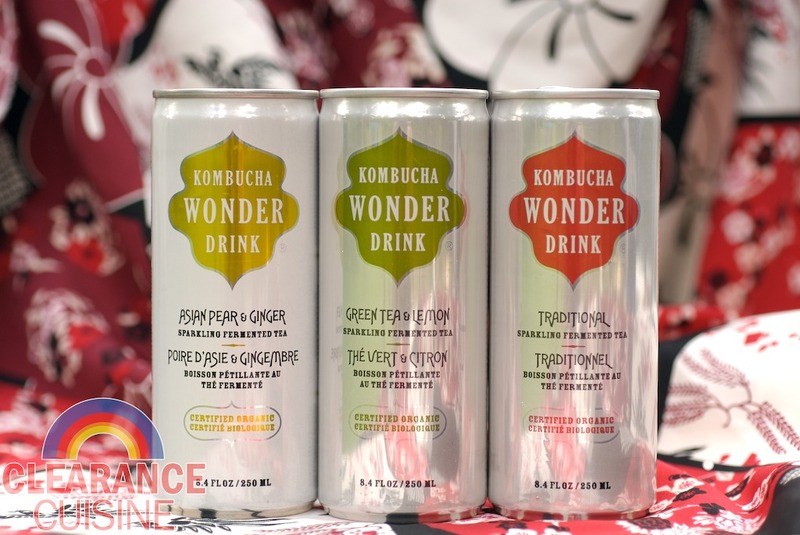 Kombucha Wonder Drink’s website claims that this stuff can detoxify your body, give you energy, aids digestion, however, all followed by that delightful little asterisk noting, “These statements have not been evaluated by the Food and Drug Administration. This product is not intended to diagnose, treat, cure or prevent any disease.” While I’m not always as skeptical and paranoid some other reviewers, honestly, I’d rather just enjoy a food or drink product’s taste, and hey, if it provides some health benefits, more power to me! However, this is being said with the slightest bit of irony, as I just shotgunned a glass full of cod liver oil. Mmm, lemony. Kombucha Wonder Drink is also described as “curiously tart”. I’ve noted in the food marketing world the word “curiously” may sometimes be used as a synonym for the word “uncomfortably” (note: Altoids – Curiously Strong Mints). While this isn’t necessarily a bad thing, if it’s unexpected, it may not float your boat. We popped open all three 8.4 oz cans at once and dosed them out into tea cups (see below). Coincidentally, the lineup below is the same order I’d rank the flavors in terms of drink-ability. The Asian Pear & Ginger was akin to biting into a juicy pear and realizing that it’s been sitting in your fridge for the past three months. While this may sound like a bad time, you immediately realize the pear is still sweet, a bit tingly and may make you say things you don’t intend to (while kombucha alcohol levels may occasionally get up to 3-4% [which prompting new labeling for some brands] Wonder Drink is way under the 0.5% labeling limit). The Green Tea & Lemon flavor was passable – generally the only thing I want to associate with lemon and effervescence is a toilet bowl cleanser, but to each his own. The final flavor was the “traditional” kombucha brewed from oolong tea, which contained no juice or fruity flavors. In this case, I think the addition of a juice would be preferred. While some people may prefer the “straight” taste of the plain kombucha, it does have a tart, almost medicinal taste, hence why most brands end up adding juice. 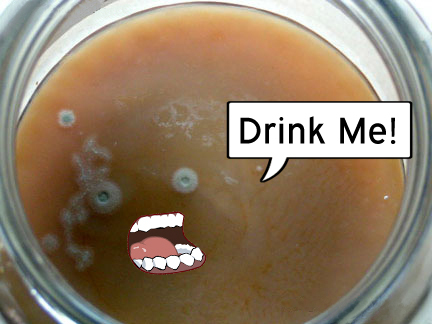 If I chose to have kombucha again, I could always try making it myself but then I risk possible contamination, disease and having a jar with a giant disc of bacteria sitting my garage. However, at 71 cents a can, I may just pick up a few cans of Asian Pear & Ginger to enjoy when I’m not in a boozy mood…though that could be easily remedied. This entry was posted on Saturday, July 16th, 2011 at 8:00 am	and is filed under Drinks. You can follow any comments to this entry through the RSS 2.0 feed. Both comments and pings are currently closed.